The Fool card in the Tarot takes the completed energy of the Universe card and transmutes it into the start of a new journey! It’s almost like looking at the world anew through the eyes of a child. Let’s look at the images on the card and then we’ll look at the symbols. The background of this card is a sunlit atmosphere on top of a yellow/white diamond shaped background. Yellow is the colour of the element Air. The white diamond shapes signify Kether, the 1st Sephiroth on the Tree of Life. In front of this background is a rainbow and a vineyard. The rainbow represents the promise of new life and is a link between the higher and lower energies of the chakra system. The vineyard signifies ecstacy and creative energy. Three flying creatures can be seen: a dove, a vulture and a butterfly. The dove represents the descent of spirit into matter; the vulture signifies Mut, the Egyptian mother-goddess considered to be the creator of all things; and the butterfly is the symbol of Air and the soul. In front of the vineyard are lilies and white roses. Lilies represent purity crowned by Spirit and the white roses signify Kether. 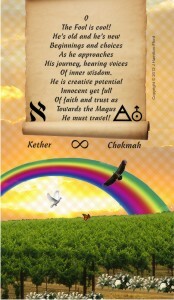 The lemniscate lies between Kether (Crown) and Chokmah (Wisdom) and represents infinity. The symbol for the zodiac sign Uranus is accompanied by the elemental symbol for Air and across from this lies the Hebrew symbol Aleph relates to the element of Air and the Scintillating Intelligence of the path between Kether and Chokmah on the Tree of Life. The verse was given to me, or channeled. I ‘zone out’ and start typing and that is what emerged. I think it represents the Fool energy quite well. Any time you transmute energy, you keep a small part of what was and invite what is new to create something completely fresh. A new journey requires listening to that still small voice and applying creativity, faith and trust to go confidently forward without becoming attached to the outcome. What do you see in this card?